Some comic book superheroes make you think, and some make you wonder. 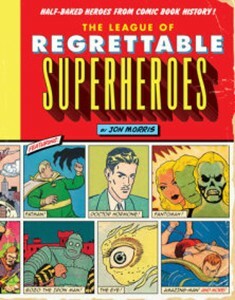 Guess which ones show up in Jon Morris’s The League of Regrettable Superheroes? This labor of love appears just in time for Antman to hit theaters, and reminds us that there were plenty of other righteous crusaders out there who were even more awkwardly conceived of than he. Like Bee Man. And Doll Man. And Nature Boy. There is a great spirit of throw-them-at-the-wall-and-see-who-sticks to many of these comics, and a cheerful disregard for logic and continuity. It’s hard not to feel some affection for these guys once we get to know them. And we do get to know them, through all the profiles of poorly-conceived and coolly-received superheroes stretching from the thirties into the nineties. Some of them simply missed the mark. Many of them seem to be full-out messing with us (Mother Hubbard? Really?). The whole thing is an extremely amusing snark-fest, but it has to be. Some of these characters are so ungainly the only other option for them is tragedy. For example, there is one benighted creature called Brother Power the Geek, a hybrid hippy/Pinnochio who straggled through two issues before being put out of his misery by the publisher. Morris, who also runs the comic blog Gone and Forgotten, shows us how all these heroes fit into the grand scheme of things. He provides us with a concise and witty history of the evolution of superheroes in the comics, and the various cultural fashion trends that they followed on the way to their flame-outs. Heroes may be more than merely men, but they don’t exist in a cultural vacuum, after all. All of them arise to face the main threats of their particular days. The early Golden Age years had gangsters and Nazis to battle, the fifties and early sixties had rogue atomic power and the Cold War, and the seventies, eighties and nineties had, well, other stuff—more Russians, and some angst. Morris breaks his chosen heroes out alphabetically by era for ease for reference. And he does pad his catalogue a little bit by including a few characters that were actually advertising gimmicks or product tie ins, like AAU Superstar and NFL Superpro. But these shills did actually appear in comic books, making them superheroes in a very broad sense. 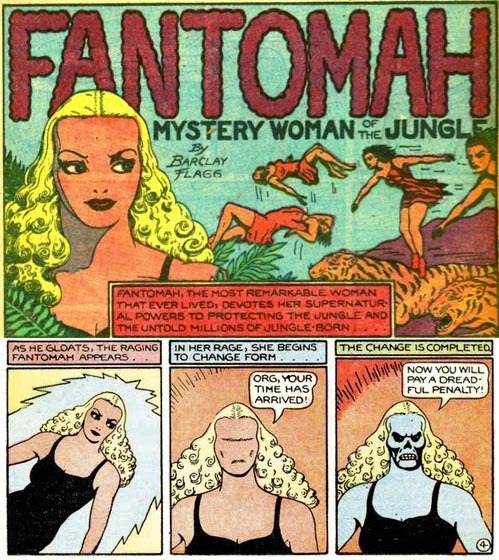 There are quite a few female superheroes documented here, too, ranging from the humanly heroic Pat Parker to War Nurse to the ghastly Fantomah to the happily married Pow-Girl and the cheerfully odd Squirrel Girl. They are, like their male counterparts, representative of their eras. However, in one unexpected and disturbing illustration, the 1976 character Captain Ultra shoves to the ground a female superhero who dares to flirt with someone else. I didn’t think the seventies were still so cavalier about casual dating violence, but I guess I was wrong. The illustrations are generous, with at least one full page of each entry devoted to a cover or a representative inside page from the comic. The art, in all its four-color glory, is frequently familiar. Many of these titles came and went by way of Marvel and DC, and more than a few big names have been involved in these misfires. Even such giants as Jack Kirby, Jerry Siegel and Joe Shuster, Will Eisner, Steve Ditko, Neal Adams, and Stan Lee produced some less-than super heroes in the giddy rush of the early days and in the quest to stay relevant in the following decades. As Morris points out early on in The League of Regrettable Superheroes, the overwhelming majority of superheroes have bizarre origin stories—and many of the characters he profiles here are no more or less unlikely than Superman, Spiderman, or the Flash. Many he includes aren’t really that bad at all, despite being variously irradiated, immolated, and reconstructed by aliens. Some of the “regrettable” titles were even modestly successful in their time. Surprisingly, several of the characters he pegs as failures were, by his own admission, interesting and had fairly decent runs. Some have even been revived at least once. They just didn’t strike the same chords with the American public as the ones who became the big guys did, and so fell by the wayside rather than striking gold in reboot and retcon heaven. Some of these heroes may even be worth tracking down and getting better acquainted with through the rather colorful resources of the Digital Comic Museum and Comic Book Plus. As always, please share your thoughts and opinions in the comments section.